In today’s consumer choice-driven economy, lack of choice and flexibility have come to be seen as major deficiencies of traditional, employer-provided group health plans. 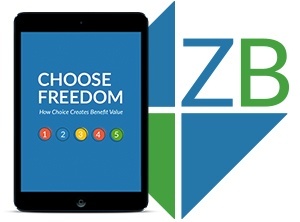 Zane Benefits announced today the publication of a new eBook, "Choose Freedom—How Choice Creates Benefit Value"
This small business resource gives historical context to the rise of employer sponsored health benefits, and the dynamics of the current health insurance market. As the cost of employer sponsored plans have increased incrementally, over the past 15 years, many new challenges have been introduced. Most notably, the increasing difficulty small business administrators face as they struggle to afford health benefits and compete for top talent. According to Zane Benefits, small businesses can create a competitive advantage by offering health insurance choice. In other words, stringent group plans aren't the only option, and often they fail to meet the individual needs of employees. Small businesses should consider a choice-based plan that is employer funded, but employee owned. This type of plan allows employees to choose and purchase their own individual health insurance plan, then get reimbursed for their premium. "It's all about the power of choice," says Zane Benefits VP of Marketing, Mark Farr. "When we treat health insurance like a consumer product, the value of that product increases. More valuable benefits translate into satisfaction and productivity—which are the reasons we offer benefits in the first place." The new 12-page eBook serves as an informational resource for any business considering a modern solution to their health benefits needs. How recent legislative changes have created a hybrid solution, allowing small business to save money and offer superior health benefits. Zane Benefits is the leader in individual health insurance reimbursement for small businesses. Since 2006, Zane Benefits has been on a mission to level the benefits playing field for small business. Their software platform helps businesses reimburse employees for individual health insurance plans for annual savings of 20 to 60 percent, compared with traditional employer-provided health insurance. Zane Benefits' software has been featured on the front-page of The Wall Street Journal, USA Today, and The New York Times.